Oh my…. compartments on compartments on compartments, being a not naturally organised person, but really longing to be, I LOVE THIS BAG! I also end up taking WAY too much stuff with me, my partner is the master of travelling light. He encouraged me to travel through italy for a month with a backpack and 6kgs… left to my own devices I’d always leave the country with an overfull 30kg suitcase + carry on + a handbag and always on the limit of my travel allowance. He made a valid point of needing to leave room for shopping, my former self would have just bought (and lugged) another suitcase around with me or shipped one back home mid trip! In hindsight I am grateful because I came home with SO much shopping, but I did curse a bit at the time of packing. Any way I digress to a life pre tiny human…. 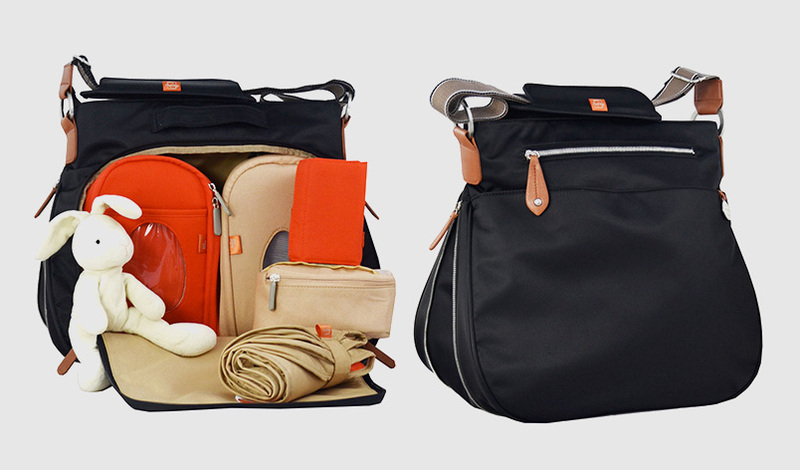 It’s a good looking bag, with pods for various activities to keep you organised. Looks like a sophisticated handbag. The pods are removable, which makes restocking easy! The food pod, is a teensy supercute backpack, that makes me imagine my little boy being big enough to carry it and how cute he’ll look. For now it’s an insulated snack bag, that’s a great size for a munchkin starting solids. It’s easy to get into any section of the bag without needing to unpack to find the one thing at the bottom that you need. The massive plus for me on this bag is that each piece can be used individually. That means that if you only want to take nappy change stuff, you can throw that pod under your pram or in a regular handbag. Only want to take food – (obviously when baby is potty trained or your making a massive rookie mistake leaving nappies and change of clothes at home), take that pod – this is the one that converts to a tiny backpack, which will be handy in a few years when my boy can carry his own stuff. I thought the pods may be too small or an awkward shape and they are deceptive just how much can fit in. I tested the bag with MCN’s after a mum on the facebook page mentioned most bags she has tried are too small to fit 3 – 4 MCN’s, I won’t lie – it’s tight, but doable. You do need to use the other compartments for the change of clothes. The insulated lunch pod has a matching stubby cooler – aka bottle insulater. It’s easy to wipe clean and a good size to carry snacks etc. Just pick the containers you are coing to use wisely so you can maximise the space. The parent bag has an extendable zip. I love this as it keeps the bag small when you are not out on big trips or can expand if you head out for longer day trips or those times you need to take the BIG toy or extra layers. There is a nice tight seperate section that’s great for a phone, purse and basic non bulky handbag essentials – it’s better suited for flat items. There you have it, a quick run down from a mum of an 8 month old boy. Any questions about the bag, let me know, I’m happy to share my opinion and experience. Let us know, what are your nappy bag essentials? Next articleThe most important thing you’ll need after giving birth.